I had never candied anything other than pecans until I did these the other day. Of course it's no harder to do than than the Cinnamon Sugar Candied Pecans ... I guess I never really thought about it. 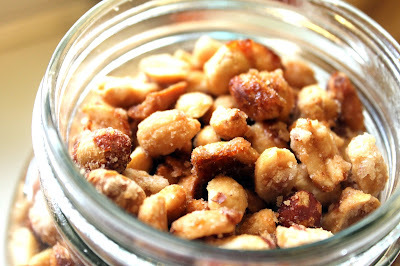 Then I made some Honey Roasted Peanuts for my husband, and he asked if I could candy some peanuts like I did the pecans, and I thought, why not? 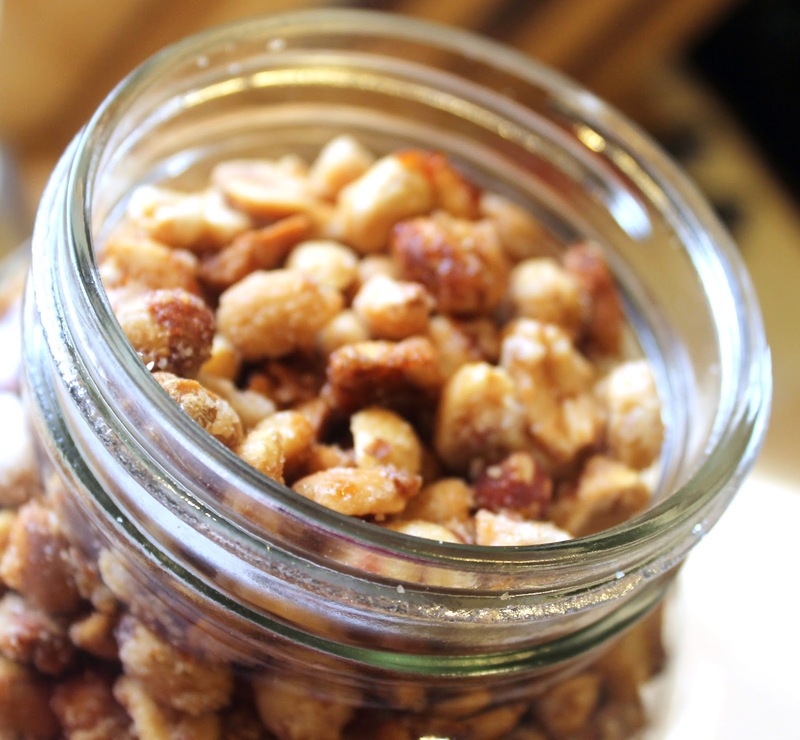 Naturally you can do this with any nuts you like, or a mixture of nuts. They make a great little snack, addition to baked cookies, a nice crunch in trail mix and more. PLUS they're so easy and inexpensive to do, and store well for several weeks in a tightly sealed container such as a mason jar. Preheat oven to 300 degrees. Line a 13 x 18-inch sheet pan (that has sides) with heavy duty aluminum foil. Pour on melted butter and spread out so that pan is evenly coated. In a large bowl, use an electric mixer to beat egg whites and water until stiff peaks just start to form. Blend in sugar and salt. Fold in peanuts and spread mixture in a single layer onto prepared pan (it's going to look like a sticky, gooey mess - trust me, it'll all work out). Bake for approximately 30 stirring and flipping peanuts every 10 minutes (I use a wooden spoon or rubber spatula). Watch nuts very closely during the last 10 minutes of cooking time, removing them from oven sooner if they are getting too dark. Nuts are done when they are mostly dry and golden brown. The peanut and egg white mixture will be very wet and gooey at first. Do your best to flip the peanuts and spread them back out into a single layer the first few times that you stir them. After the first couple of times, you'll see them start to come together and look more like the finished product. 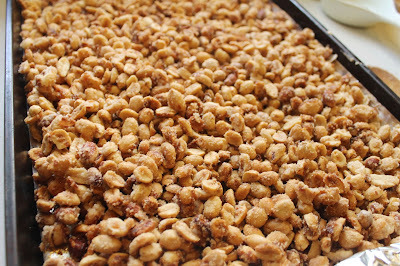 Allow peanuts to cool on pan until they are completely dry and crunchy, stirring occasionally to break them up. Store in an airtight container for two to three weeks. Cooks note - Sugar burns quickly. Be sure to stir every 10 minutes and keep a close eye on them.